After trying a number of different diary / planner layouts, this is the format our family has been using the last few months. 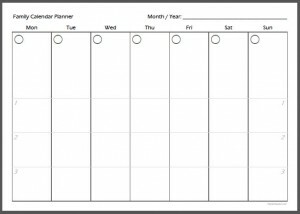 It has a week to a page, with a space for each family member. It’s nothing fancy, but I’ve put it up here in case you find it useful. Here is the previous iteration too, this one is just a simple two weeks to a page. Just print on to A4 paper, punch holes to fit your binder, write in the applicable dates and you’re ready to go! This entry was posted in Downloads, Organise and tagged Organiser, Printables by Sammie. Bookmark the permalink.